In his programme notes, Director Mike Sparks said that the Guild Players 'try to present a traditional approach to pantomime, including as many of the expected and anticipated features as possible'. 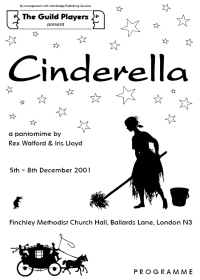 This was certainly so with their surprisingly good production of Cinderella on 5th to 8th December. This is arguably the most difficult Pantomime to pull off from an audience point of view. The tale is so well known with its rags to riches story, very familiar characters, well trailed and anticipated phrases, and popular special effects. What struck me first about this production was the stunning scenery. Not surprising to learn then that this was produced by Mari I'Anson who many locals will recognise as a significant artist in her own right. Mari's sets were amply complimented by the bright and well thought out costumes provided by Jenny and Irene Sparks. Pantomimes like this are a nightmare to review, because where do you start with a company of twenty, all of whom had at least something to say. This, of course, is where amateur groups can gain over the professional offerings who are constrained by budgets and profit motives. It can also be the point where they fail. The Guild Players were helped by the script they had chosen by Rex Walford and Iris Lloyd, who wrote this particular offering deliberately for the amateur stage. So whilst everyone had something to say, no one got out of sync with the others. They also had some 'old hands' in the cast to carry the Ugly Sisters (Laurie Heatherington and Alan Jobson) and a wickedly unpleasant Baroness Hardupp in Judith Shrank. This was a splendid combination of experienced actors obviously enjoying their roles. Paul Sparks (Baron Hardupp) provided a suitably 'hang-dog' foil. David Constable (Buttons) injected energy every time he arrived on stage and Sally Martin and Lynda Gordon (the Brokers Men) presented us with a music hall double act as they unsuccessfully sought to remove the Baron's effects! The Fairy Godmother (Margaret Johnson) delivered all the appropriate lines to an accompanyment of flashes, bangs and smoke. Ruth Griffiths was clear and confident as Cinderella; a good singing voice and nice presentation. Newcomer to the group, Victoria Harris, stood out as Prince Charming. Another Guild Players Panto regular, Jessica Mori, was a stridingly good Dandini in love with Miranda (Laura Lovett), a girl inexplicably on roller skates. Bill Davey and Stewart Shrank were King and Flunkey respectively. The chorus, on for most of some acts, were Marianne Bigg, Jill Brooksbank, Ann Hefford, Mari I'Anson, Jesse Stephens and Andrea Wood. But what about the effects - how did they turn the pumpkin and mice into a carriage for Cinders, and how did she get transformed into her Ball gown in a twinkling of the eye. Now that would be telling. Suffice to say that it did all happen as it should. With music directed by Carole Clarke, choreography from Anne Fisher and lighting by Brian Clayfield, The Guild Players delivered the goods again.